Which Circuit Judges Could Retire Today? Wow. So Harry Reid went nuclear. Just 51 votes are now required for cloture on votes to confirm U.S. District Judges and U.S. Circuit Judges. (1) Will Senator Leahy, Chair of the Senate Judiciary Committee, adhere to the “blue slip” protocol, under which both home-state senators must approve a nominee? Who’s the appellant, what’s the appellee, and I don’t know if we have jurisdiction. 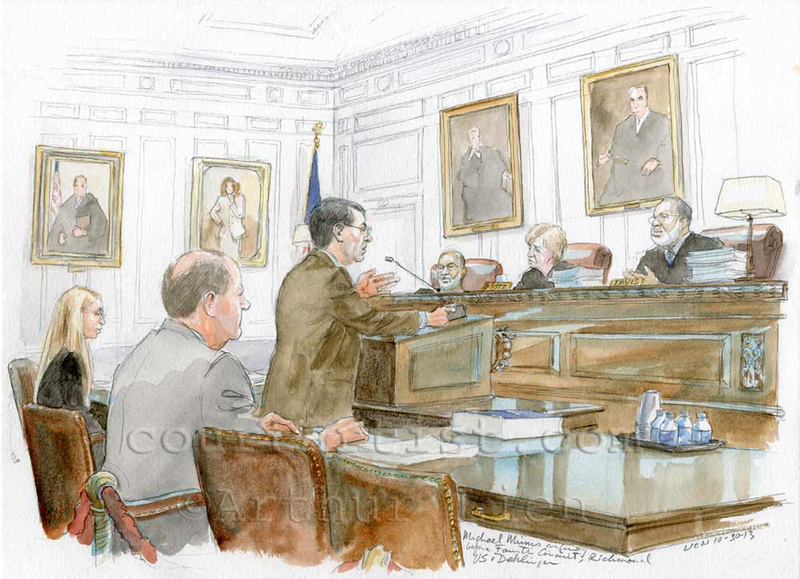 Supreme Court sketch artist Art Lien recently posted some amazing sketches from the October 30, 2013 Fourth Circuit argument in United States v. Dehlinger, No. 12-7121. As luck would have it, two of the panelists (Judges Diana Motz in the center and Andre Davis on the right) are Maryland-based. The third is Judge Roger Gregory of Virginia. With Mr. Lien’s permission, I’ve re-posted two of the sketches below. The first provides a wonderfully detailed view of the Fourth Circuit’s Red Courtroom (Room 412). 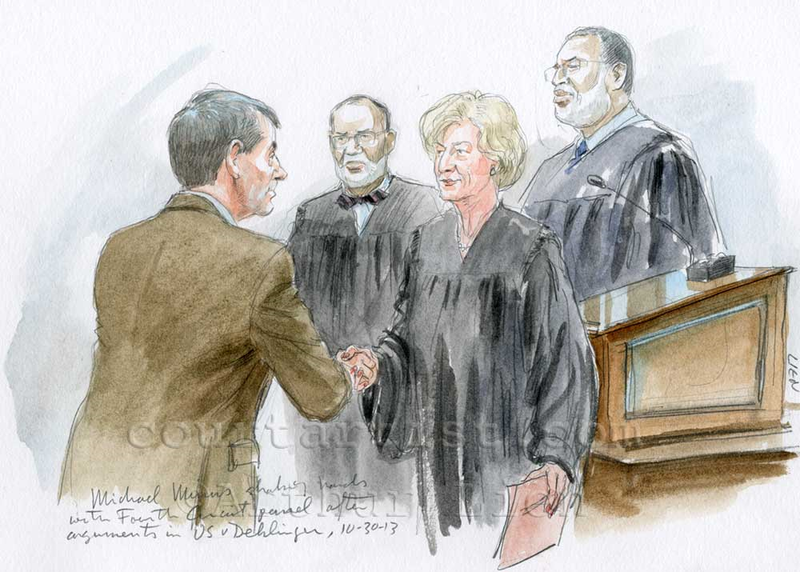 The second depicts the grand tradition of the Fourth Circuit shaking hands with counsel after each argument. I’m particularly fond of the handshake tradition. In an appeal that I took over in 2010 as a result of the illness and untimely death of one of my firm’s partners, the dearly missed Max Lauten, Judge Davis, who sat on the panel, made a special point of conveying his condolences. Judge Davis did write the opinion against my client, but I do genuinely appreciate the thoughtfulness of his published opinion. According to the Fourth Circuit’s argument calendar, the issue in Dehlinger was whether the “district court correctly denied relief on ineffective assistance of counsel claim that alleged counsel’s representation was tainted by conflict of interest.” Briefs are available here. Audio of the argument is available here. On the occasion of Wall Street discovering that Facebook is no longer cool, and on the occasion of the Supreme Court denying certiorari in the Facebook privacy class-action, I decided finally to offer my thesis that Justice Clarence Thomas is a justice for the Facebook era.